"Stop motion animation is not a new thing. Quite the opposite. It's the designs of these characters and the world itself, that is really something special. Following along with a lost and found sign as your guide, may seem a little weird if not strangely ironic; but that's just the tip of the iceberg in this short film from Catya Plate. 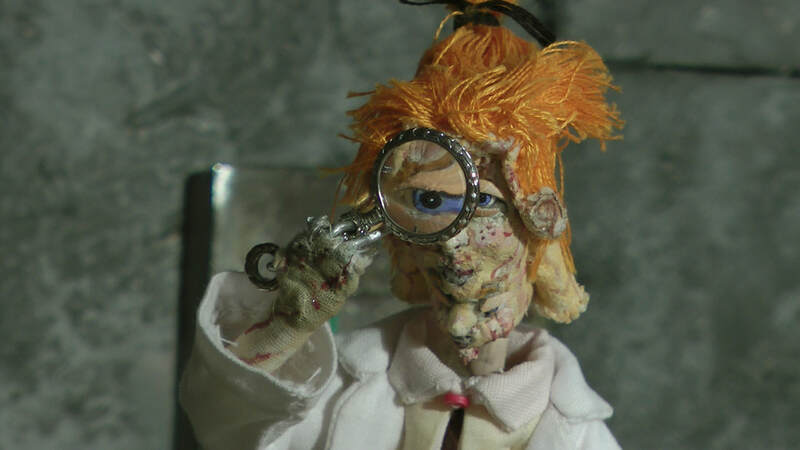 This animated stop motion spectacle takes weird and makes it wonderful. If a living sign is not proof enough? Perhaps consider the Clothespin Freaks. These are the scientists of the world, and are just as odd and unusual as our guide herself. These Clothespin scientists are scouring what's left of the world looking for artifacts - of us - humanity. Parts and pieces of humankind hanging around waiting to be claimed and rebuilt into new humans... into Homeys, as this world calls them. But that's not all. As these Homeys are nearing completion there is still another step before their self reliance. A trip to meet Gormal MacGuffin, who is one of the species that has survived the end of the world. We know them as groundhogs. With his important guidance, these Homeys will become the next version of humanity. Human 2.0. Maybe all is not lost after all? If the description of this short film doesn't strike you as weird - than perhaps you should grab that pen or keyboard and write out a book; because I bet you have all kinds of game changing ideas hidden inside. Myself? Dang. This was a crazy concept. Just crazy enough to be awesome! But if the description alone doesn't sell you? The presentation and character designs will. They are all perfectly borderline crazy. Enough to really sell this crazy new world, and perhaps hope the next chapter will find the Homeys have been successful. Boy oh boy, Meeting MacGuffin is a wonderfully strange world full of equally strange inhabitants. The real cherry of this short film is the eye candy. A massively educated groundhog is one thing. The freakish characters are another thing. Even the slightly grotesque idea, of finding and stitching organs together, much like Frankenstein, is it's own story all together. But it's the presentation that takes top marks. Stop motion animation is not a new thing. Quite the opposite. It's the designs of these characters and the world itself, that is really something special. Catya Plate has a knack for weird - and that knack fits perfectly into this story. The bold nature of this title does the trick and does it so well. If the collection and reanimation of body parts seems unnatural - perhaps you should consider the unnatural state of our planet. If Meeting MacGuffin seems a little horrific sometimes - perhaps you should consider the horrific things we are doing to this big blue world we call our home. Under the polished guise of an animation, is a real message. Just because Meeting MacGuffin is entertaining to watch, and holds some jokes under it's collar doesn't mean it's message isn't visible. It's all a clever ploy to get us to watch and maybe listen to what's actually being said. However, when considering this as a purely entertaining production, this was sure fun to watch and will surely please and delight people of most cinematic fancies. A little something for everyone as they say. Four stars.